Forty-one percent of teens who live in a home where a firearm is kept reported having easy access to it. Teens with additional risk factors for suicide are just as likely to have such access as those not at risk, University of Washington researchers report in a new study. Suicide is the second-highest cause of death among adolescents in the United States, of which nearly half are committed with a gun. In fact, just having a gun in the home increases the risk of suicide. In the study, published in December by JAMA Psychiatry, Dr. Joseph A. Simonetti and colleagues analyzed data from National Comorbidity Survey–Adolescent Supplement, a nationally representative sample of more than 10,000 US adolescents, ages 13-18. “The main finding was that children with mental health risk factors for suicide are just as likely to report in-home firearm access as those without suicide risk factors, and that was true even when comparing firearm access between children with no suicide risk factors those who reported a suicide attempt in the preceding 12 months, who, I would argue, are probably at the highest suicide risk of those surveyed,” said Simonetti, a research fellow at Harborview Medical Center's Injury Prevention and Research Center. The survey screened teens for mental health diagnoses such as depression, bipolar disorder and drug and alcohol abuse, as well as whether they had ever thought about, planned or attempted suicide. It also asked the teens whether guns were kept in their home, and if so, whether they could get a gun and “shoot it right now” if they wanted or whether the guns or ammunition were inaccessible. The researchers found that about one in three of the teens lived in a home where there were guns; of those, 40% said they could access and fire the gun. These teens tended to be slightly older, more likely to be male, come from higher-income families and live in rural areas than those who lived in a household with a gun or guns but did not have access to the weapons or ammunition. 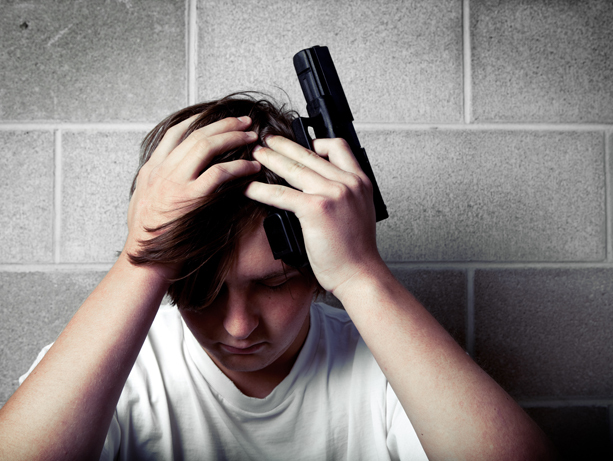 The teens who reported ready access to guns were also significantly more likely to have a history of drug or alcohol use disorders, Simonetti said, a finding that was particularly concerning because substance abuse and access to firearms is associated not only with an increased risk of suicide but also unintentional firearm injuries.